Heart Bypass Surgery is an open-heart surgery that is used to treat blockages of the heart arteries. When there is a heart artery blockage, blood supply to areas of the heart are affected. A heart bypass is attached beyond the blockage restoring blood flow to that area. Heart bypasses are either arteries or veins taken from other parts of the body including the chest wall and the legs. This article is a picture guide to heart bypass surgery that takes you through many critical stages of the operation. Coronary artery bypass grafts; three grafts are depicted here, a left internal mammary artery (LIMA) to left anterior descending (LAD) and two saphenous vein grafts – one to the right coronary artery (RCA) system and one to the obtuse marginal (OM) system. The LIMA graft is surrounded by yellow fatty tissue in the forefront of the diagram, the RCA graft departs the left side of the aorta and wraps around the heart on the left side of the diagram, the OM graft departs the right side of the aorta and wraps around the heart on the right side of the diagram. The most well known bypass is called the LIMA to LAD. LIMA stands for left internal mammary artery and is an artery that runs from the left collarbone area down the chest wall. LAD stands for left anterior descending artery which is the artery commonly responsible for the ‘Widowmaker Blockage.” In a bypass it is carefully taken down from the chest wall and attached beyond a blockage acting as a bypass. The LIMA to LAD is very successful as a bypass and has good long-term results. In other types of bypasses, arteries can be taken from the forearm, or veins can be taken from the legs. Read this article on heart blockages and this article on the ‘Widowmaker” for more information. This article titled “how long does a bypass last” is useful and goes in to a little more depth about the different bypasses. 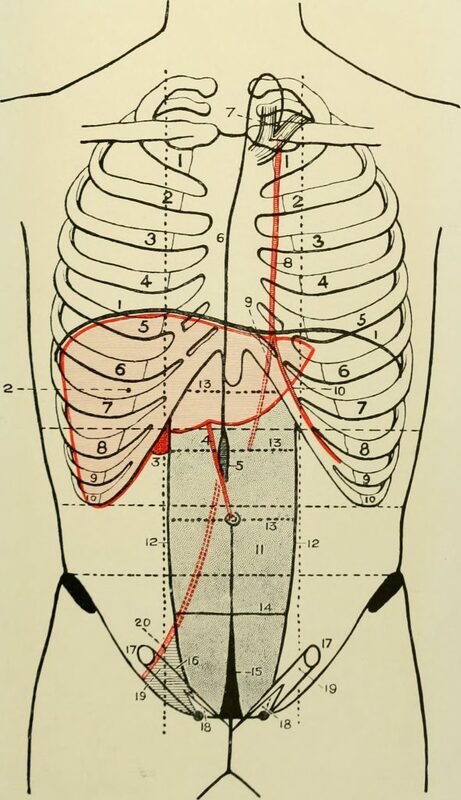 The Left Internal Mammary Artery (LIMA) is depicted here and is labelled #8. The first operative step in a heart bypass surgery is cutting the chest wall to expose the breastbone. A scalpel is used initially. Then electrocautery is used to dissect through the superficial layers. In these images the superficial tissues are dissected through, then the deeper layers down to the breastbone. 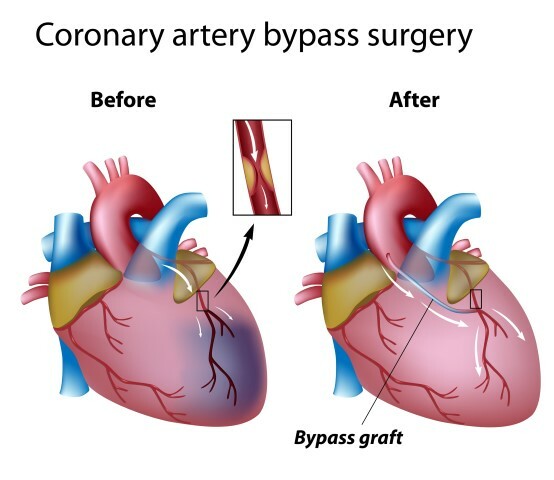 Heart bypass surgery is an open-heart surgery and the heart needs to be exposed. In the case of bypass surgery this is done by sawing through the breastbone in a technique known as median sternotomy. A specially designed electric saw is used for this. A median sternotomy is demonstrated in the next image. Once the bone is cut, small bleeders are cauterized to stop the bleeding. As described above, the best bypass to use when possible is known as the LIMA. This runs on the left inner chest wall. In this next image the breastbone on the left is retracted and then the LIMA is freed up from the chest wall so it can be used as a bypass. In the old days of heart bypass surgery the leg was literally cut open to expose then harvest the leg veins to be used as bypasses. 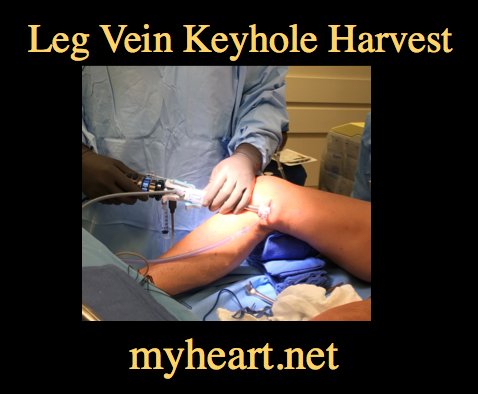 A more modern technique is known as endoscopic harvest where a small endoscope is inserted in to the leg and a keyhole technique is used to take out the vein to be used as a bypass. This leaves us with a much smaller leg wound and improved healing with less complication. 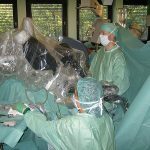 The patient undergoing heart bypass surgery is placed on a heart lung bypass machine to take over the work of the heart during the operation. This allows the heart to be stopped. Some people advocate doing heart bypass surgery on a beating heart, most do not, it is an ongoing debate with no clear winner. The bypasses are cut appropriately. The small branches on the side are clipped so blood isn’t lost when they are attached. The veins are expanded with fluid to ensure they are competent for use. The arteries to be bypassed are carefully exposed. The bypass grafts are then carefully attached. Good technique here is critical to ensure good results. In many patients other operations will be needed at the same time. Patients with mitral regurgitation (a leaky mitral valve) or mitral stenosis (a tight mitral valve) may need mitral valve repair or mitral valve replacement at the same time. Patients with aortic stenosis or aortic regurgitation may need aortic valve replacement at the same time also. Once the heart bypasses are attached the heart can be restarted so it can start beating again in its normal fashion. The breastbone is closed using a technique known as sternal wiring to hold it together until it heals over time. After that the superficial tissues and the skin can be sutured together. 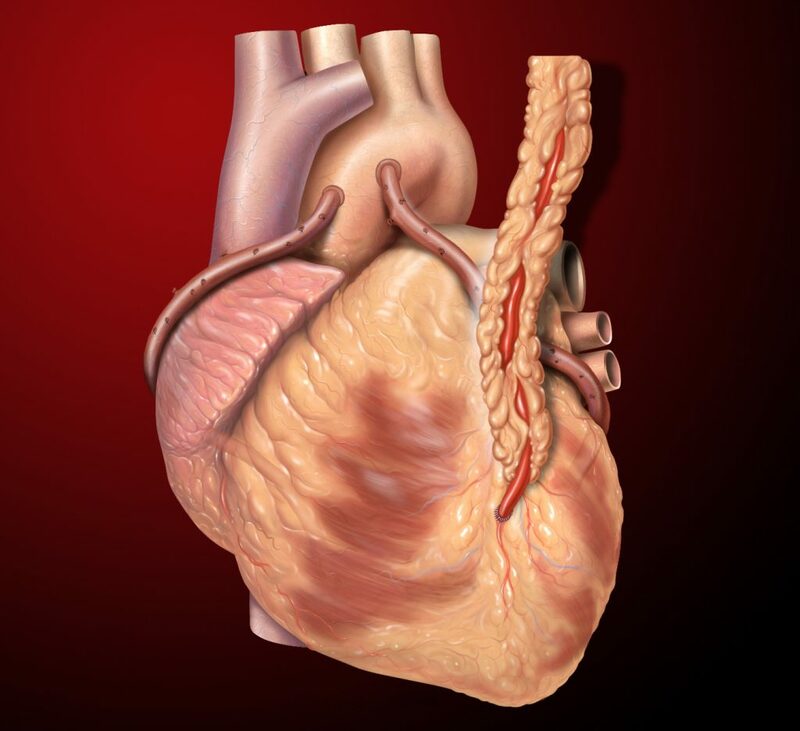 Drains are left in the heart sac and the lungs to allow drainage of blood over the next 24-48 hours. After heart bypass surgery the patient will be transported to the cardiac intensive care unit. The breathing tube is typically taken out the same day. Patients are typically in the hospital 3-5 days after heart bypass surgery. 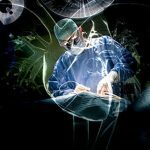 This article was extremely helpful in understanding just what will happen during surgery. It is very informative. I had triple by-pass surgery 12 years ago and now the arteries are blocked again even after losing 80 pounds, taking medications faithfully, etc. Is it possible to have more surgery? Redo bypass surgery is certainly possible if required but depends on many factors including the health of the patient and the condition of the heart. These situations require a good work up. This may include viability testing to see if the heart tissue is viable and would benefit from reestablishing blood supply. There have been significant advances in stent technology also and there may be options such as CTO procedures. What’s better for a 100% blocked LAD? LIMA or stent? It differs in every case and i would need to see the films and know the story to comment. In most cases, if a good sized LAD and totally occluded, LIMA is a good option given its longevity, particularly if the disease is considered conplex. On December 6, 2016 I had a triple bypass with less than 24 hours notice. I have a thorough understanding of the procedure, but it was very enlightening to watch the video clips. My dad had a double bypass in 1978 and I’m amazed that this type of surgery is even possible, especially in 1978. I’m just so grateful to be alive! My dad went through the surgery but he had complication with internal bleeding. The doctor said the blood was not flowing through his bowel and they had to remove 80% of his bowel post surgery. Is this a Known complication ? Was there any preventive they can have done to help save my dad? Very sorry to hear that. Difficult to comment without knowing specifics. This can occasionally be seen in cases where the overall blood supply to the bowels is diseased beforehand or where there is prolonged periods of low blood pressure. My wife had a quadruple bypass 6 years ago at age 55.. How long can we expect her procedure to last? I’ve heard anywhere from 10-15 years. Is that correct? Many bypasses can last a lot longer. Its important to continue medical and lifestyle treatment the whole while. I am Mohamed Mufeezulla khan, recently two days ago my mother again got an heart attack, before twice heart attack happened to her in the same place, this is the third time. They have put twice the stent, again it is blocked. Doctor giving us 2 option. They can able to Bypass Surgery or they will put balloon. I am worried about this. My mother age is above 50 years. Also she is not strong. They are discharging today and said will give the date to do the operation. Kindly suggest me which is better. What should I decide, whether Bypass surgery or shall I ask them to put balloon. My father is no more, only my mother is everything for me. I believe on ALLAH next on Doctor. If possible, please let me know the advise as soon as possible. They are saying Bypass is a risk, if it is get success there would be a guarantee for 10 years and for the balloon for 2 years guarantee. But they saying as if they put the Balloon again there would be a chance for the blockage. Depends on the local recommendation and the patient condition, however if balloon has already failed then a surgical option may be important. Had bypass surgery in Oct 2017 healed fine no problem. My leg where they took vein, is still causing me pain. Where the incision is. A band is numb around my ankle. Pain gets to the point can’t lift leg . My question is is this normal healing? You should get that evaluated and other issues ruled out. It needs to be evaluated by the treating surgical team. I had a triple bypass on April 5, 2018 I am still in a lot of discomfort in my chest and my left leg where the vein was harvest is still a sleep I am still getting sharp pain at night down my left leg. Is this normal. I am only 20% percent the active woman I was prior to my surprise surgery. What should I do next. Start by making an appointment with the treating surgeon to review the wound and leg. In 22 December 2016 I had a redo CABG through a left thoracotomy where a graft was inserted at the end of a vein graft where one of the good bifurcation vein was admitted with a 1.5mm shunt. Following this procedure chest pain vanished and despite two years of daily long walking, chain pain was being felt occasionally whenever i exercised. My cardiologist referred me to stress echo and CT scan and blood tests and ended up adding doubling my beta blocker (bisoprolol fumerate to 5mm daily, 375mg of Ranexa to be taken twice daily every 12 hours and 25mg of spironolactone on top of the other medication that i was one i.e 10mg ramipril, crestor 20mg, ezetralex, 70mg aspirin. In his report my cardiologist stated that if chest pain started recurring he will raise Ranexa to 500mg twice a day and if this fail he will go for PCI using eluding drugs. Two years ago my cardiologue has informed me that inserting the stent is difficult and could be risky because the mamal graft that was used to the LAD is tortuous and that is why when the same Ranexa drug that he gave me then failed to stop the chest pain he recommended to do the graft through the back. in 1985 i had my first CABG where three graft were inserted using 1 sephanous vein to the OM and two mamal ones to the LAD and RCA. The sephaneous occluded about 12 yeard aog. Opening the chest for the redo was considered inappropriate. I can send you the report of the CT scan and stress echo. The EF was 43% a reduction from 47% before the redo cabg. The report of the CT talked about recersible stenosis and diffuse atheroma on the LAD after the LIMA. Its not really possible to comment technically without seeing the cath films. Have you seeked a second opinion from an interventional specialist?